An avantgarde graphics system control that delivers true realtime 3D graphics to the web. Its unique rendering engine, entity structure, shading system and other properties produce a complete and remarkably easy to use, yet fully customizable 3D environment with modern effects that have previously been seen in realtime exclusively in desktop applications outside the web browser. Based on the cutting edge Microsoft Silverlight technology, SilverMotion is a reliable control and requires only a web browser and Microsoft Silverlight in order to run - no additional custom plugins, third-party components, JAVA nor Flash required. SilverMotion provides reasonably fast realtime rendering with modern effects like bump mapping, refraction and reflection mapping, cell-shading, multi-texturing, dynamic lighting, fogging, smooth grouping, fully dynamical cameras and more. With it's sophisticated rendering engine, SilverMotion utilizes multi-core CPU systems in order to extract the maximum performance of modern hardware. The goal of SilverMotion is to provide an easy to use, functional, compatible, visually appealing and practically applicable real-time 3D environment for the web, ready to cover any need. Import entire 3D scenes with a variety of dynamic lights, cameras and meshes with materials and shaders applied with a single step. Simply put the SilverMotion component into the Silverlight development enviornment and import your .3DS file, exported directly from a 3D modelling environment (Blender, 3DS Max, Maya, MilkShape and etc.) into it. That's it. The scene will be rendered, ready to be interacted within your browser. Resource files can be put on a server and loaded dynamically or to be embedded as resources in your application. SilverMotion supports loading from a zip-packed 3DS models and textures to reduce loading times on slow Internet connection. SilverMotion offers user friendly, yet fully functional API, designed in every step to be logical and obvious for any user. SilverMotion's software architecture wraps the abstract logic and mathematics of 3D into user API, aimed at purely practical tasks, the very most of which require no previous knowledge of 3D mechanics from the developer. SilverMotion's goal is to deliver functional 3D immediately and to anyone. Visit our FAQ page where you can find answers to the most frequently asked questions. In addition to the vast graphics features provided by SilverMotion's shading system, it provides all the functionality concerning scene dynamics you need to pour more life into your 3D setting. Automatic keyframe animation, fully dynamical cameras with run-time adjustable position, target, FOV, Lens focal distance, screen aspect ratio and projection type, customizable objects transformations and motions, precise screen-picking and other features provide a complete environment for rendering dynamic and interactive 3D scenes. Read more in the technical specifications page and see some action at the demos page. 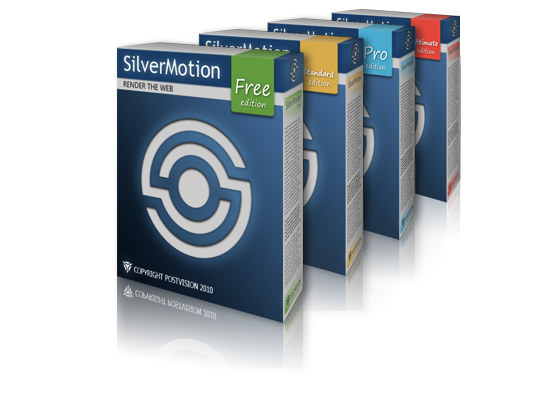 Silvermotion comes with a non-commercial license over a Free edition and a commercial license over a Standard, Professional and Ultimate editions. Read more at the editions page.